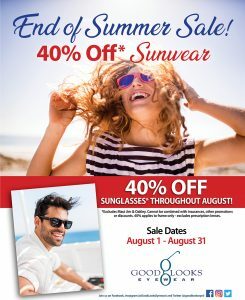 Good Looks Eyewear is holding a special End of Summer Sale! From August 1st-August 31st customers are able to purchase any complete pair of sunglasses for 40%off of the retail price! (Excluding Maui Jim and Oakley). This includes Ray Bans, Tom Ford, Persol, Chopard, Bvlgari and all of our other sunglass collections. If you have any inquiries about the sale, please contact our Cranberry Township or Pittsburgh location for more information. Be sure to take advantage of this summer send off sale while you can!